Ramping up what has fast become one of rock's most exciting reunions, +LIVE+ have released the official music video for "Love Lounge" (Kavalry Records)--the first new song from the original line-up in over a decade. The video distinctly bottles the band's legendary live power and prowess into a frenetic and fiery visual companion. Directed by Clay Patrick McBride [Metallica, JAY-Z], the video intercuts intensely claustrophobic performance footage with a high stakes and high pressure poker game highlighted by a femme fatale besting any hand on the table. The viewer follows vocalist Ed Kowalczyk through the subways as the locations span everywhere from Washington Heights and Soho to various rooftops in and around NYC. Their shadow looms over the city powered up by thick distortion, hard-hitting guitars, and Kowalcyzk's electrifying vocals as he sings lyrics like: "Through the smoke I see her comin' near me/Through the haze I see the hourglass/Hypnotized or mystified now I don't know." Catch the multi-platinum band--Ed Kowalczyk (vocals, guitar), Chad Taylor (guitar, backing vocals), Patrick Dahlheimer (bass) and Chad Gracey (drums, percussion)--in all their glory through this video now. "Love Lounge" sees the reunited band firing on all cylinders and marks their first new single together with a music video since 2008's "Forever,"and it sets the stage for the release of a forthcoming EP (exact details and dates TBA). Get "Love Lounge" via Kavalry Records here. The single/lyric video debuted last month on RollingStone.com with Ryan Reed praising it as "thunderous" and noting that "Kowalczyk alternates between a muted, bluesy rumble and a full-throated roar on the track, singing over psychedelic guitar leads, swooshing hi-hats and layers of distortion." 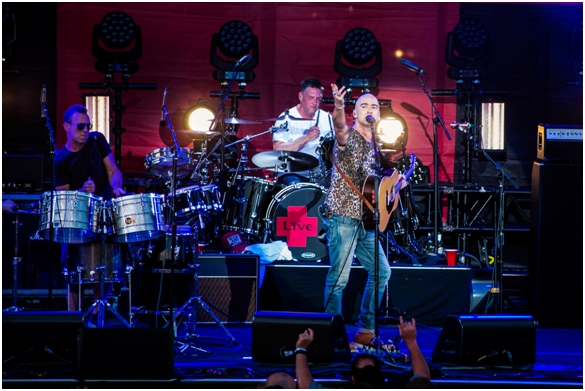 +LIVE+ is lighting up venues coast-to-coast all summer with Counting Crows. This past weekend, Jerry Harrison--the legendary Talking Heads member who's produced albums for +LIVE+--joined the band to play keys on "The Distance" which the band merged into a version of Talking Heads' classic "Take Me To The River" in Mountain View, CA. Jane's Addiction drummer Stephen Perkins came onstage in Irvine, CA, to provide additional percussion on "The Distance" (images below). The full itinerary for the "25 Years and Counting" tour can be found here. (L to R): Stephen Perkins, Chad Gracey and Ed Kowalczyk. Multi-platinum alternative rock band +LIVE+ will return this fall with THE TURN, their first album of all-new material following a long hiatus. Set for release October 28 on Think Loud Recordings, the 11-track album features original members Chad Taylor (Guitar & Backing Vocals), Patrick Dahlheimer (Bass and Percussion), Chad Gracey (Drums and Percussion), who are joined by Chris Shinn (Lead Vocals & Guitar). The album was co-produced by Jerry Harrison and +LIVE+; Harrison also produced three of the band’s previous albums: 1991's Mental Jewelry, 1995's Throwing Copper and 1999's The Distance to Here. To kick off the album’s release, the band are launching a Pledge Music (http://www.pledgemusic.com/projects/live) campaign today (8-28-14) with a portion of the proceeds going to Musicians On Call. PledgeMusic is the world's leading online, direct-to-fan music community, offering artists a unique way to engage their fans in the music making experience whilst interacting with PledgeMusic's global community of music fans. Details of the album’s first single and video, along with U.S. and international tour dates will be released thru Pledge and +LIVE’s+ social media platforms over the next few weeks. The release of the album will coincide with the 20th anniversary of the group’s eight-million selling Throwing Copper. That album produced the band’s biggest single, “Lightning Crashes,” which was #1 at Modern Rock radio for 10 consecutive weeks. With two #1 albums already under their belt and more than 20 million albums sold worldwide, +LIVE+ are ready to enter the next chapter of their career. Additional details re the band’s upcoming world tour will be revealed in the coming weeks.